Balances fashion collections Spring / Summer 2012 began on 27 June last for the happiness of many of us, eager for bargains of all kinds. 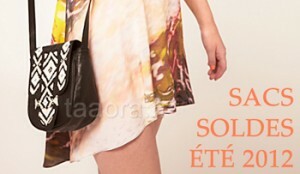 Because the bag is one of the indispensable fashion accessories, here’s a jumble of bags on sale at low cost, between 19 and 35 €, and for all styles of beach bag to evening bag. Kudos for this woven straw bag dark gray Morgan (on sale at 35 € instead of 45 €) in a very chic with its paw leatherette extended by a metal tab on the flap. 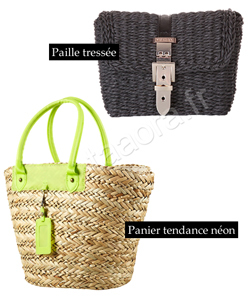 For the beach, we love about this great basket of straw neon trend created by the British brand Topshop (on sale at 20 € instead of 39 €) with mint green fluorescent coves.